It is a link from one website to another. Google considers it as an important factor in determining your page rankings. Recently they updated the search engine algorithm, as a result of that your page will rank higher or lower according to the quality of links. If you have backlinks from top-level sites, will rank higher in search results otherwise lower. We have to explore high-quality backlinks to get search engine traffic. How can you find such links that are beneficial for your blog? Spying. 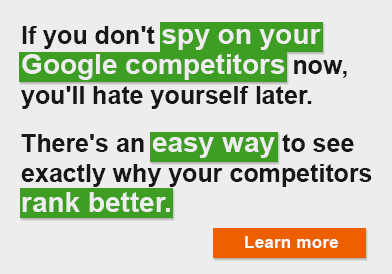 Yah that’s what I said, spy on your competitor’s backlinks. Analyze their link building strategies, identify best links they have and start building your own. SEMRUSH, Ahrefs, Majestic SEO are best, top tools to spy on various parts of your competitor sites. It includes backlink analytics, indexed pages, organic search, traffic, keyword analysis etc. But they are premium tools and provide very limited access to the results. These are the best free tools to analyze the backlinks of any site. Open Site Explorer, a Moz product, is also a premium tool. But it lets you explore up to 200 backlinks of a site for free. Open Site Explorer will show in-depth site metrics that cover Domain Authority, Page Authority, Root Domains, Total backlinks, link source, whether it is a Dofollow or Nofollow, spam score of the linked domain and authority. All links will be shown along with the attribute, so you can quickly locate the required link to boost own blog’s SEO. Rank Signals is another free tool to discover new link opportunities. It is a good companion for the bloggers to improve SEO profile and earn top-level backlinks. Just enter a domain name in the search box to check the backlinks it has. Rank Signals will show the linked page, anchor text, total internal and external links in the site, rank and link attribute. You can quickly find the total backlinks, Alexa rank and social metrics of your competitors on the top of the results. Backlink Watch is a free online tool to spy on your competitor backlinks. It displays link URL, anchor text, total external links from the referring domain and attribute. Backlink Watch is connected to several research tools like SEMRUSH, Ahrefs and helps you identify the competitors, external backlinks, referring domains, ranking positions, and keywords of the domain easily. Are you using any backlink checker tools to spy on your competitors?